Acute lymphoblastic leukemia (ALL) is the most common malignancy diagnosed in children, representing more than a quarter of all pediatric cancers. The image below depicts bone marrow aspirate from a child with T-cell acute lymphoblastic leukemia. Also, see the Childhood Acute Lymphoblastic Leukemia: Diagnosis, Management, and Complications slideshow to help recognize and treat this disease and its associated complications. Children with acute lymphoblastic leukemia (ALL) often present with signs and symptoms that reflect bone marrow infiltration and/or extramedullary disease. When leukemic blasts replace the bone marrow, patients present with signs of bone marrow failure, including anemia, thrombocytopenia, and neutropenia. Symptoms of CNS involvement are rarely noted at initial diagnosis but are more common in T-lineage and mature B cell ALL. Testicular involvement at diagnosis is also rare; if present, it appears as unilateral painless testicular enlargement. Complete morphologic, immunologic, and genetic examination of the leukemic cells is necessary to establish the diagnosis of ALL. 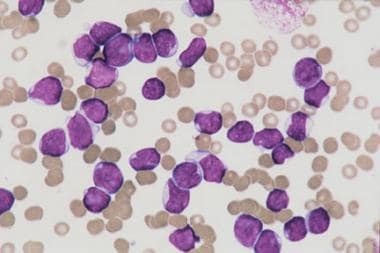 See Acute Lymphoblastic Leukemia Staging for more complete information. Leukemia is a systemic disease, and treatment is primarily based on chemotherapy. However, the different forms of ALL require different approaches for optimal results. Treatment of subclinical CNS leukemia is an essential component of ALL therapy. Intensification/consolidation phase: The importance of this phase is undisputed, but consensus is scarce on the best regimens and duration of treatment. Current Children's Oncology Group (COG) ALL protocols use a therapeutic backbone that was originally introduced in Berlin-Frankfurt-Muenster (BFM) clinical trials in the 1980s. This includes administration of cytarabine, cyclophosphamide, dexamethasone, asparaginase, doxorubicin, MTX, 6-MP, 6-thiouguanine, and vincristine. CNS-directed therapy consists of systemic chemotherapy that enters the CSF, as well as intrathecal chemotherapy administered throughout the entire course of treatment, which is primarily MTX but sometimes includes hydrocortisone and cytarabine (“triple-intrathecal therapy”). Treatment of T-cell ALL may benefit from high dose methotrexate and the addition of nelarabine, but clinical trial data regarding these two interventions is still pending. Mature B-cell ALL needs to be treated in the same way as disseminated Burkitt lymphoma, with short-term intensive chemotherapy, including high-dose MTX, cytarabine, and cyclophosphamide over a 6-month period. Blood transfusions or antibiotics may be required to deal with complications of ALL therapy. Do not administer folate supplementation owing to interactions with MTX. Allogeneic HSCT (hematopoietic stem cell transplant): Usually following second complete remission after relapse (if early) or first remission in high risk patients; potentially prevents relapse and/or mortality vs chemotherapy alone. In generally, surgical care is not required in the treatment of ALL. However, placement of a central venous catheter is needed for administering chemotherapy, blood products, and antibiotics, as well as for obtaining blood samples. Acute lymphoblastic leukemia (ALL) is the most common malignancy diagnosed in children, representing one quarter of all pediatric cancers. The annual incidence of acute lymphoblastic leukemia within the United States is 3.7-4.9 cases per 100,000 children age 0-14 years,  with a peak incidence in children aged 2-5 years. With improvements in diagnosis and treatment, overall cure rates for children with acute lymphoblastic leukemia have reached 90%. The use of risk-adapted treatment protocols has improved cure rates while limiting the toxicity of therapy. This article summarizes the current diagnosis and treatment of childhood acute lymphoblastic leukemia. In acute lymphoblastic leukemia (ALL), a lymphoid progenitor cell becomes genetically altered and subsequently undergoes dysregulated proliferation, with clonal expansion. In ALL, the transformed lymphoid cells reflect the altered expression of genes usually involved in the normal development of B cells and T cells. Several studies indicate that leukemic stem cells are present in certain types of ALL. Annually, around 3000 children in the United States are diagnosed with ALL. The annual incidence of ALL within the United States is 3.7-4.9 cases per 100,000 children 0-14 years of age  with a similar estimated worldwide incidence, although it has been questioned whether the incidence may be less in low-income countries. White children are more frequently affected than black children, and there is a slight male preponderance, which is most pronounced for T-cell acute lymphoblastic leukemia. The incidence of acute lymphoblastic leukemia peaks in children aged 2-5 years and subsequently decreases with age. Although a few cases are associated with inherited genetic syndromes (eg, Down syndrome) or congenital immunodeficiencies (eg, Wiskott-Aldrich syndrome, ataxia-telangiectasia), the cause remains largely unknown. Environmental risk factors such as exposure to ionizing radiation and electromagnetic fields and parental use of alcohol and tobacco have not been shown to cause pediatric acute lymphoblastic leukemia. In addition, no direct link has been established between viral exposure and the development of childhood leukemia. Standard-risk patients are aged 1-9.9 years with WBC of less than 50,000 at presentation, lack unfavorable cytogenetic features, and show a good response to initial chemotherapy. The Children’s Oncology Group (COG) defines standard risk as less than 1% blasts in peripheral blood by 8 days and less than 0.01% blasts in bone marrow by 29 days (rapid early response). Low-risk patients have < 0.01% blasts for both time points and have favorable cytogenetics (eg, trisomy 4, 10). High-risk patients do not meet these criteria or have extramedullary involvement that makes it inappropriate for them to be treated as standard risk. Very-high-risk patients have unfavorable cytogenetic features (Philadelphia chromosome, hypodiploidy (n < 44), MLL gene rearrangement or poor response to initial chemotherapy (induction failure or Day 29 bone marrow with MRD >0.01%). The 5-year event-free survival (EFS) varies considerably depending on risk category, from 95% (low risk) to 30-80% (very high risk), with infant leukemia having the worst outcomes: 20% for patients younger than 90 days. COG redefined very high risk to include high risk patients ≥13 years of age, which made the range of outcomes wider for this subgroup. Overall, the cure rate for childhood acute lymphoblastic leukemia (ALL) is more than 80%. Five-year survival rates for children diagnosed with ALL rose to 90% from 2000-2005, which was up from 84% in 1990-1994. Improvement in survival was observed for all age groups of children, except for infants younger than 1 year. In low-income countries (LIC), therapeutic results for pediatric ALL have been less encouraging due to delayed diagnosis, abandonment of therapy, and death from toxicity due to suboptimal supportive care. Nevertheless, current 4-year event-free survival rates are 61% in India,  and over 78% in Lebanon,  demonstrating that pediatric ALL is curable in LIC. Ensure that the patient's parents and guardians understand that ALL usually does not have a known cause, that accurate stratification helps guide therapy, and that participating in institutional or consortium-based clinical trials may help lead to better outcomes in the future. In addition, parents and guardians must know the expected adverse effects of each medication and be able to recognize signs and symptoms that require immediate medical attention, such as those for anemia, thrombocytopenia, and infection. Furthermore, parents and patients must know how to quickly access medical help from the oncology team. For patient education information, see Cancer and Tumors Center, as well as Leukemia.